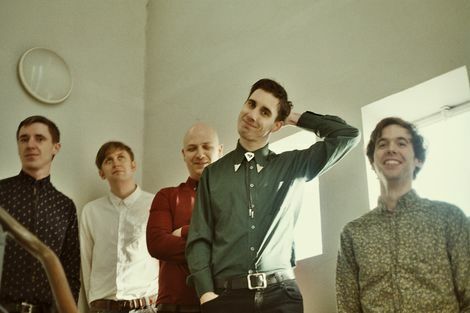 A meteoric rise backed by a superlative debut album has seen Outfit move with ease onto the international stage, Getintothis’ Harry Sumnall finds the five-piece wearing their fame like a comfortable pair of jeans. 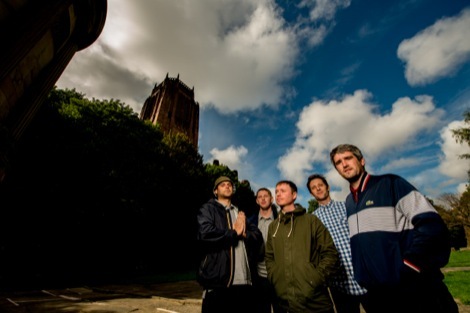 Since their emergence on the Liverpool scene in 2011 Outfit have rarely put a foot wrong. Considering the initial buzz around the band, and members’ previous history in a number of almost-but-not-quite-made-it acts it was somewhat inevitable that they would be nominated for the inaugural GIT Award in 2012, but while their inclusion on the shortlist then may have been more of a hopeful recognition of their potential, it is clear that their appearance this year is a true reflection of their impact and talent, and the widespread affection in which they are held. If you’re looking for a pop band that can best symbolise the confidence of new Liverpool music, an act that are reaching out to escape the past and create a new reference point, then Outfit could be the ones to do it. The band comprises Andrew Hunt (vocals, keyboards, guitar, and percussion), and Thomas Gorton (keyboards and vocals), the band’s primary songwriters, with no less important contributions from Nicholas Hunt (guitar), David Berger (drums) and Christopher Hutchinson (bass). We were able to catch up with Andrew during a busy time for the band, having just played at the inaugural BBC 6 Music Festival. Right from their debut live performance supporting Les Savy Fav Getintothis was attracted to something in their intoxicating simplicity. Successive releases on Double Denim; favourite Two Islands in 2011, and 2012’s Another Night’s Dreams Reach Earth Again, culminated in 2013’s Performance album, which we declared a “superlative statement of intent“. Across a rich ménage of tracks the group’s lyrics explored self-concept, and the doubts arising from the inevitable tensions between personal and group identities that emerge during the path to independence. This was a personal album that suggested a willingness to communicate sometimes difficult shared experiences, but it was delivered in a way that avoided cheap sentiment or dire melancholy. It was also expertly produced, with many reviewers writing how it had seemed to have arrived fully formed, its core musical messages transparent and immediate. Performance delivered a complete insight into the band. After such an open examination though, it seems difficult to imagine that future works could be so introspective, something which may be inevitable now that critical and creative success have lead to a much more public examination of their work and motives. This also provides opportunities though, with the band much better able to focus on their musical aesthetic. All bands engage in myth making to a certain degree, and in this sense it has been sometimes difficult to see past the enigma of Outfit; their early online presence was deliberately crafted, interviews rarely revealed much beyond broad artistic statements, and were littered with half truths and distractions. More recently though, there’s the impression that the band are becoming more approachable and open about their music making processes and intent. It’s interesting to speculate whether this is because with increasing popularity and critical support Outfit are becoming more comfortable with the broader priorities of pop music – that of personal testament, receptivity to the listener’s own demands, and a willingness to change and reflect these back to them. Whatever the reason, it’s a pleasure to hear them talk about their music and reflect upon the changes that growing success produces, but also to consider how this might affect the band dynamic and conceptualisation of their approach. “I feel that our dynamic as a band hasn’t changed much,” says Andrew. “Making the album and touring it gave us all individual roles to fill, with a united sense of purpose, which was very fulfilling. Certainly, the themes expressed on Performance have in the past also seemed to echo Outfit’s own development as a band. 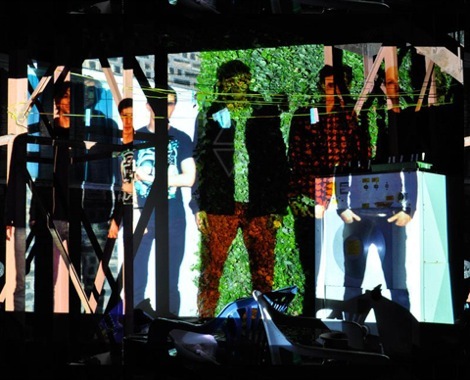 Quickly outgrowing Liverpool and perhaps also the weighty expectations placed upon them by others, the band dispersed, temporarily relocating to London in order to write and record. Its unclear whether this was an altogether happy time, but once Performance was released, it was clear that they had been able to avoid pressures for their music to reflect geography or any collective state of mind. The band themselves seem to feel less of an affinity with Liverpool music as a whole, than with spontaneous microscenes and DIY enterprises that link adventurous musicians globally. Andrew reflected: “For me the origins of a band are important, but they’re not geographical. So for us, we’re five men, who have quite a wide experience of music making. 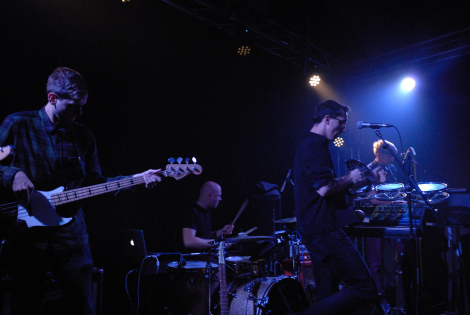 Although choosing to limit the number of their Liverpool shows, performances, both as headliners, and most recently in support of Foals, have been rapturously received, providing a reminder that although Liverpool may not produce as many (inter)nationally important bands as it used to, every once in a while we do produce some that resonates beyond the seven streets. Outfit’s live performances are something special, the focused rhythmical interplay and pulsating art disco that drove Performance is washed over with swooning intensity and effortless passion. Here is something that is both cerebral and infectious. After a busy recent European and UK tour with Crystal Fighters and Dutch Uncles, we’ll grant them their recently announced restorative furlough – but we do selfishly insist on great things on their return. Now primarily based back in Liverpool, implicitly suggesting they have nothing left to prove, the band have the time and space to begin demoing again. So, while Outfit may win this year’s award based upon all they have achieved over the last two years, it is perhaps what could come next that is most interesting. Their strong visual aesthetic also suggests that we may also see some non-pop projects. The short film produced in collaboration with London director DEERHEADcx to accompany I Want What’s Best, indicated a genuine social conscience that would lead to some fine storytelling. Similarly, their semi-improvised piece for Mercy’s spiritualist cabaret back in 2012, Electronic Voice Phenomena, revealed parallel talents that could develop beyond the constructed restrictions of traditional pop music. 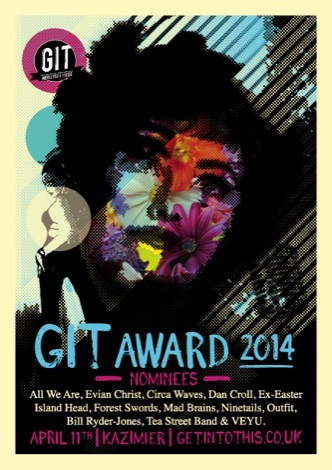 GIT Award 2014 launches One To Watch prize. GIT Award 2014 judging panel announced. Review and pictures from GIT Award 2014 launch at Leaf. GIT Award 2014 returns with Leaf launch ahead of Kazimier spectacular in April. The GIT Award 2013 report, reaction and review from Leaf Tea Shop, Liverpool. GIT Award 2013: picture gallery featuring Baltic Fleet, Nadine Carina, Conan, John Heckle, Tyler Mensah and more.